Travelpro redefines premium travel with Platinum Magna 2. The new and improved Platinum Magna 2 collection features this 22" Expandable Rollaboard Suiter, made of high density Ballistic nylon with DuraGaurd coating to provide extra durability. Stylish and sophistocated top and side leather grab handles along with a molded bottom cup provide convenient and comfortable hand-holds. Tapered expansion capability of up to 2", this bag is engineered to resist damage with the SUPRA Zipper Heads that feature a reinforced bridge and extra-narrow gap to keep zippers intact and working reliably. Featuring high performance sealed ball-bearing inline skate wheels and patented PowerScope aluminum extension handle that minimizes wobble and has three stops at 38", 40" and 42.5" to accommodate travelers of various heights. Loaded with features, this Platinum Magna 2 bag is the pinnacle of fashion, intelligent functionality and design innovation. The Platinum Magna Expand Rooaboard Suiter. Does the fold out suit compartment zip completely out? Is there an add a bag feature? 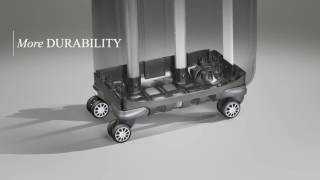 What is the difference between a Travel Pro Platinum Magna 2 22" Expandable Rollaboard Suiter and a Travel Pro Platinum Magna 2 22" Express Rollaboard Suitcase? Is free shipping available for Alaska? A quality compact bag that has been great on multiple trips across country. PROS: Liked it so much I bought one for my daughter for Christmas. She was jealous of mine! PROS: This is a nice looking carry-on, expandable, and I was expecting much from it given the previews reviews. Yet carry-on does not roll well standing up, bu needs to be leaned at an angle to use the two wheels. CONS: The 2 wheels are horrible to navigate. Carry-on does not roll well standing up, say, next to the passenger, but you need to lean the carry on on an angle, for it to roll easily. I had the worst time traveling from Ithaca to Baltimore in October with this new carry-on, it did not roll smoothly and I was very tired from all the effort I put into rolling the suitcase. PROS: Nice size interior. Rolls nice. The handle is comfortable and smooth (when it works). I like the tiedowns in the middle of the bag, it helps to organize your things into a top and bottom layer which kind of forces you to pack more thoughtfully. CONS: This is the 2nd Travelpro bag I've had where the telescoping handle has broken on my 1st trip with it. Zipper on the top front pocket is of very poor quality, I am afraid the teeth are going to break every time I use it. This bag is clearly not up to snuff quality wise for a premium product. I was once very loyal to Travelpro but they are 0 for 2 in my last two bags I've had. If I could return this one and try another brand, I would. PROS: I have only taken one trip with my new TravelPro Platinum Magna 2 Luggage, but I am very happy with it! Light, strong, and well designed, it is just the bag I have wanted and needed. Plus the price was great through Luggage Pro. CONS: Like everything so far. PROS: Great bag! Lots of room inside bag for clothes. CONS: Not really, maybe four wheels but was fine with two for me. PROS: The size is perfect, the build quality is top notch, the handle is sturdy and the wheels roll so smoothly. CONS: Only slight complaint is the side grab handle. It should be a little more flush with the frame as the handle tends to catch against the seats when you're pulling it down along the narrow aisle of the plane. PROS: Used the bag about a year. 67 days on the road, three trips to China, one Europe some domestic. it is just a great bag, light strong and I did get it from Luggagepros. CONS: sometimes I wish it had 4 wheels but most of the time I don't. PROS: Love the extra pockets and pouches for cosmetics and underwear. The expandable zipper is also a big plus. Went on an extended weekend trip to NYC and had to take 3 pair of shoes. No problem for this suitcase. It's light, attractive and can accommodate everything I need. We liked this suitcase so much, we bought it for our son, who travels with his new job. PROS: The ease that it rolls, seems almost effortless. The ease of loading into the overhead bins and the ease of unloading from the overhead bins as well. It gives me the ability to pack far more items in a much more organized manner, which makes locating items just that much easier. This is my first purchase of a piece of carry on luggage and from the research that I did beforehand, it was a great purchase and one that I would do again. PROS: High quality luggage that stands up to heavy use. Lightweight as well. I highly recommend all sizes of the Travelpro Platinum Magna 2 luggage. I have both the rollaboard (22") and the checked luggage size (26"). PROS: I liked the volume of clothes that this bag can handle. I specifically bought the roll-along luggage (with 2 rolls and stationary stand) and not the 360 deg 4 roll bag for the extra cavity capacity afforded the 2 rollers versus the 4 rollers. I recently used it as carry-on to Vegas and managed to pack: 3 dresses (one was formal), 2 pairs jeans, 1 pair capris, 3 shirts, 2 sweaters, 1 pair of shoes, plus undergarments and creams/lotions. It rolled very well and the handle was a good height. There was a lot of walking to and from the airport terminal to the land transportation and the handle felt good in my hand and it rolled very smoothly. Easy to place in the overhead compartment on the plane. Overall a really good bag and I look forward to using it more in the future. Smaller than my old 22". PROS: The Travelpro Platinum Magna 2 - 22" Rollaboard Carry On is a great piece of luggage. It's well-designed, has high-quality construction, and professional-looking, so it's great for business as well as personal travel. Luggagepros was all you'd want from a retailer - the best price, and the luggage arrived on-time and in perfect condition. All in all, a great purchase!! PROS: Decided to replace my old worn-out rollaboard and this bag was the best reviewed - definitely can see why. The design features are clever and there are pockets in all the right places. The handle and wheels are sturdy and well-crafted too. PROS: Almost bought Tumi......this is better quality at a cheaper price. All in a carry-on! Three medium sized packing cubes fit perfect in this with space for the shoes. Plus more space in the outer pockets for the 3-1-1, various electronics, and a 700-page paperback. Even had room for a small bag of souvenirs on the return trip. Fit and finish is on par in this price range, quiet and smooth rollers, and fit with no problems in the overhead bins of a 737. Couldn't be more satisfied with the purchase, and it was delivered in 2 days instead of 3! CONS: The main compartment zippers could be a little smoother going around the corners. PROS: Well-designed, high-quality suitcase. Well worth the price. PROS: I had forgotten to add a discount to my cart, and the LuggagePros customer support was really quick, helpful, and friendly. They edited my order and fixed it up for me. Not only was this the best price by far that I could find, they seem to take good care of customers. Also the shipping was lightning quick, arrived even a day earlier than expected. As for the bag, it's exactly as advertised. I had read the Wirecutter's review of carry-on bags and this was their pick. CONS: For the bag, really the only knocks against it is that although it looks just fine it doesn't exactly stand out as high fashion (but that may be a good thing, so thieves aren't attracted to it). Also as the Wirecutter review points out the indent that the handle goes into does take up slightly more internal space than other bags due to how the handle is curved. But on the flip side, the curvature of the handle is pretty comfy. PROS: Carry on, separate suit section, handle design, exterior pocket access, inside "gadget" pockets, expandable, durable and of course its a TravelPro. I travel for a living; there is a reason most in the airline industry and professional travelers use TravelPro. All luggage is temporary if you travel enough; TravelPro lasts the longest for the money by far. CONS: Suit section is little small, only good for only one suit and maybe three shirts. PROS: Easy to carry. Looks nice. Rolls really smooth. Fits well in the airplane. Looks solid, my last bag, lasted for 6 years an 800 thousand miles, I hope this can get there. Good price against Victronix , Tumi, or other good solid bags. CONS: Space can be compromised with the compartments. You may find hard to remove the smaller bags that you don't need on a trip. PROS: Lightweight, Great build quality, Very smooth rolling, Heavy duty zippers, meets domestic carry-on size 22" x 14" x 9" incl. wheels and handle. Classic professional look. PROS: This is a very sturdy, but easily maneuverable suitcase. I just used it for a 5 day trip and fit everything I needed in there. I did not want a black suitcase, the olive was just right. Service from Luggage Pro was exceptional: kind and courteous customer service rep and the suitcase is better than I expected. I recommended it to several family members who fly regularly for work. PROS: Great service, great suitcase, great warranty, best price I found anywhere. Buy here! PROS: Huge upgrade from my last luggage. PROS: Love the look, features, and durable construction. Ordered several matching pieces - extremely pleased with the entire set. PROS: The luggage is beautiful (olive) and appears sturdy and well-constructed. It also conforms to carry-on standards and was able to fit into the United domestic carry-on luggage bin that is used to verify that its size is within United's standards (as long as you don't overstuff it - which would make it too wide). This luggage may not be quite as convenient as the 4-wheeled type, but this allows more packing room while staying within the published carry-on size regulations. Also- the overall buying experience from Luggagepros was excellent from start to finish. This was my second purchase from them and once again absolutely no problems. 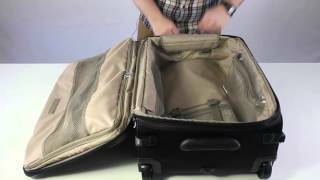 Travelpro Platinum Magna 2 22" Expandable Rollaboad Carry On - Awesome!!! PROS: High Quality and extremely versatile. We bought two so we didn't have to check our larger Travelpro Suitcase. LuggagePro was great to deal with and had the BEST pricing. Great company! PROS: This is very well made, the wheels roll very smoothly (and are quiet), and it holds quite a bit if packed properly. I finally decided to replace a Samsonite I've had for 16 years and expect this to be very durable too. I read and heard great things about Travelpro and I honestly say they were all correct, this was a great choice and will be perfect for my business trips . I was able to purchase for under $200 so it was a great buy. PROS: Seems to be a very sturdy bag. Can't wait to use it on my next trip. PROS: Has all the features I need, well built, delivered quickly damage-free. PROS: I am a retired airline pilot and found, after trying many brands of luggage, that travelpro was the one that held up the best and for the longest. I still use my travelpro suitcase that I bought in 2000 and used extensively during my last 6 years of flying. The recessed, roller blade type wheels never seem to fail. That's why I went back to Travelpro for a carry on bag that I need for traveling in retirement. PROS: I'm Sitting on a plane writing how Funtional, rugged and light this bag is. Im a regular 1-2 night at a time traveler and this is perfect size. I'm over analytical and by comparing this to more & less expense comparables in every way, this is great value! My last travelpro lasted over 10 years and only the handle broke so wanted to upgrade to new format. I'm 6'4" and my suits and big shoes fit very well. My first purchase with LuggagePro has been great too. PROS: Large inside, fantastic wheels. PROS: Stylish, appears to be well built, light weight, only 2 wheels which is better if you are hanging your PC case on it in airports, highest rated roll a board carry on that I could find using various reviews on the internet, I have used an earlier TravelPro roll aboard for the last 20+ years so I very much like the brand and my old one has held up like iron; I bought my old luggage for family and me 20+ years ago from Luggage Pros retail store in MN. They worked great for many years. This time I visited the store again, got good retail advice, and eventually purchased them on the internet; got great price and great service both online and in their retail store; I highly recommend. PROS: Very pleased with the bag and the purchase. As others have mentioned the olive color is darker than what it appears on the website and is a very handsome looking bag. This has a great amount of room for a carryon and seems to be a high quality product. Luggage Pros customer service was great, I changed my mind about the color and was able to go from the black to the olive with no problems at all, they also had super fast delivery as I received the bag two days after placing the order. PROS: I am a global traveler and have to say the price, construction and functionality of the suitcase is the best I've had in my professional career. The olive color is a deeper, richer color than pictured which is great. PROS: Very happy with both the product and the service. I ordered the Travelpro Platinum Magna 2 22" Expandable Rollaboard Suiter suitcase and it arrived in excellent condition and within a week of placing the order. I was concerned after reading some of the reviews, but I did not experience any problems. Best Bag You'll Ever Have! PROS: Absolutely gorgeous bag! I love the stylish olive green coloring and the real leather accents. It rolls wonderfully through airports and on uneven sidewalks. It is lightweight and fits so easily into the overhead compartment, even with the expansion zipper open. The garment bag is perfect for dresses or suits and the padded bars keep your garments from creasing. I can fit enough clothes for a ten day trip! The warranty is unbeatable. If you're hesitating over the price, don't! It is more than worth it! GET THIS BAG!!!! CONS: Not a single con! PROS: Excellent price and a highly recommended product.